Put your other remotes away, and use the intuitive touchscreen to switch easily between cable, Sonos, AppleTV, and Blu-ray. Add Lamp Control to set the mood for movie night—then capture the scene and recall it anytime. Just say "Food Network" or "Apple TV" to select your desired video source. 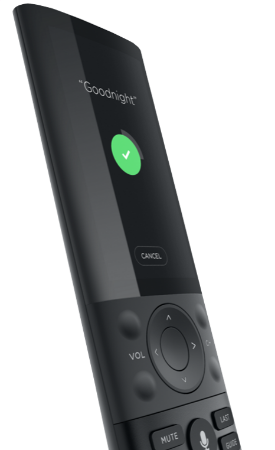 When it's time to turn everything off at the end of the evening, simply press the microphone button and wish yourself a "Goodnight."